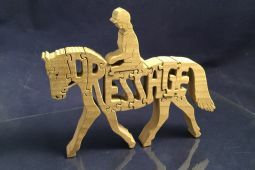 A wooden puzzle of a energetic JUMPING Horse. Approximate size is 7" tall. These make great gifts. Just take them apart and place is a gift bag for the gift recipient. They have to put it together to see what will ultimately be a horse. Beautifully handcrafted by a local artisan. Allow 2 weeks for delivery.